Via the 2012 spring game gallery. With the offensive rumors out of the way, it's on to the meat of Michigan football program: The defense. The cornerstone of Michigan's recruiting effort since Brady Hoke was hired has been to amass as much top-tier defensive talent as possible. Before Hoke was hired, Dave Brandon said he wanted to find a defensive minded coach. Hoke was most certainly that, and the immediate hiring of Greg Mattison as DC, Brandon got what he was looking for. Top-tier talent has had no problem finding it's way to Ann Arbor. But for Team 134, it's not all just about new faces – upperclassmen abound this side of the ball. But those guys are being pushed by the newcomers in the group, and that is forcing some great position races...and adding great depth, something not seen at Michigan in a while. The hallmark of Mattison's defense is depth along the line. The more the better, and Michigan is looking good in this department. 5th-year senior Quinton Washington has been getting a lot of mentions by a lot of people this spring. Sounds like he's embracing his role as a leader in this group. He could take a big step in his last year. Ondre Pipkins is another interior player who will get plenty of playing time in 2013. He's dropped a lot of weight, and that could serve him well as he had plenty to lose. Jibreel Black should also get on the field a lot. RS FR Willie Henry is a newcomer who could make an impact. I also would like to see junior Richard Ash as well. 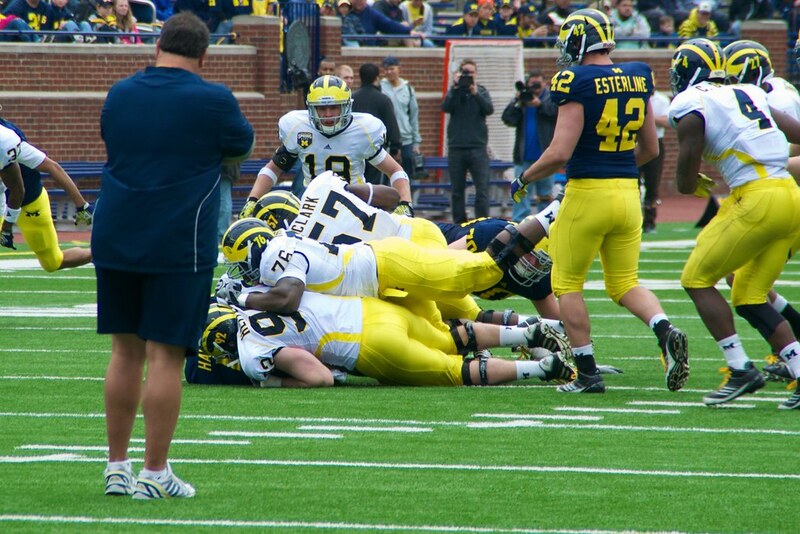 With Hoke coaching up this group himself, I expect to see some big things this year. For the ends, Michigan is stacked. Frank Clark and Mario Ojemudia are the names people know. Incoming freshman Taco, yes Taco Charlton will most certainly push for playing time. Brennen Beyer will move from DE to OLB to fill in for Jake Ryan while he recovers from his ACL tear. I think Tom Strobel could see the field a little bit. My breakout player on defense this year will be DE Chris Wormley, who redshirted after an ACL injury before last season began. He could be your strongside starter sooner rather than later. The loss of Jake Ryan hurts. There's no question about it. Had this happened a year or two ago, I would've said Michigan was screwed. But that's not necessarily the case this year. Of course we'll need him back asap, he's an all-conference player, possibly an all-American. I think Beyer moving to SAM is a good move though. I'm not sold on Cam Gordon, despite what anyone says about his off-season effort. We've heard that song before. But if he can prove me wrong, I'll come back here and admit that. Elsewhere at linebacker, Michigan is well-suited with guys like Joe Bolden, Desmond Morgan and James Ross. Young guys like Royce Jenkins-Stone, Kaleb Ringer and Antonio Poole could really help make this Michigan's strongest position on defense. Welcome back Blake Countess! With the departure of JT Floyd, Michigan has a few guys battling it out for the other starting spot. I think it's Raymon Taylor's spot to lose, but that's just my opinion. Avery is a good player, and should push Taylor. I think he'll will end up at the nickle spot. Newcomer Dymonte Thomas could compete for time. I'm also interested in seeing what Alan Gant does this spring. Buzz around him has been sort of quiet. Terry Richardson as well. Ross Douglas, however, has been getting some attention. Thomas Gordon returns to SS. It's been reported that Marvin Robinson has been at the FS spot. Only Jarrod Wilson and Josh Furman are listed as safeties on the spring roster. I think this is a position that will see quite a heavy rotation of new faces at the spring game. Should be interesting to watch. Honestly, I think Michigan's defense, even without Jake Ryan for however long it takes for him to recover, is trending in a very positive direction. These last two seasons have seen a drastic improvement from where we were at in 2010 – in all phases of the defense. While not a complete "shutdown" dominant defense these last two years, that is certainly a possibility for this group. I think it's going to be really fun to watch this group evolve from 2012 to this spring to this fall. There aren't really any glaring weaknesses like there has been in recent years. Expect some big things from Team 134's defense.